We stock all types of new hoses that fit thousands of vehicles. In addition, we can rebuild your existing hose the same day. Rebuilding a hose is perfect for new cars or very old vehicles. 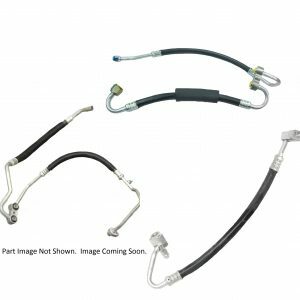 We have suction, discharge, and manifold hose assemblies available in new. Also, we carry liquid lines with the orifice tube. Deterioration can happen over time. Always check your for deterioration and leaks when you service your ac. If your hose is leaking your car will not cool. In addition, your car will leak freon and oil. Auto Compressor Worlds stock several types of leak diagnostics. Always check your system for leaks. Auto Compressor World knows ac hoses. Save money when you purchase yours here! Use our vehicle year, make, and model lookup to identify your hose. Or, call us today! We have new in stock. We also rebuild extremely hard to find or vintage ac lines.